I don’t care how many magazine covers Kim Kardashian pays to be on with little North West, that doesn’t mean that she is a great mother. Of course it’s part of the image that Kim wants us to buy into but the proof is in her daughter’s face. 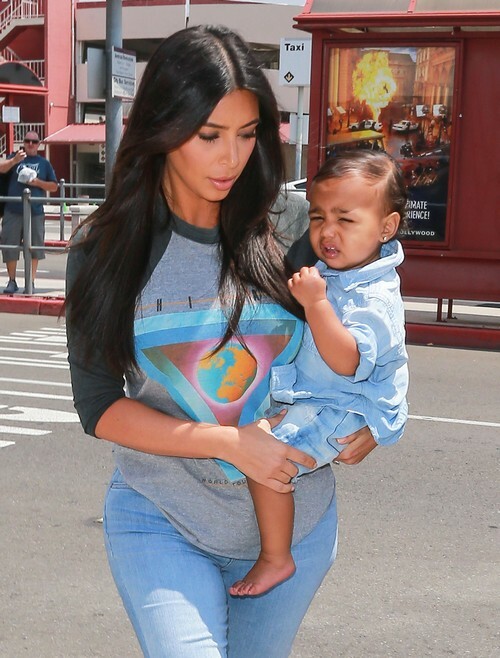 Kimmie was photographed today, Aug. 7/2014 flying out of Burbank, CA, strolling with little Nori on her hip and guess what – as usual the child looks miserable. Seriously, if you go back and do an image search, every photo of Kim holding North West is more awkward than the one before. Usually little ones instinctively hold on to whomever is holding them. Instead Nori at best looks worried and at worst pretty clearly wants to get away from her mother. Kim can try to paint a picture of being a happy mother and loving spending quality time with Nori but this little girls’ face and demeanor say just the opposite. I mean, even when she is with Kanye West, little Nori looks more animated and interactive than when she’s with her mother! That’s not to say that Kim is a horrible mom. In fact, when present she might treat North like an absolute princess but she’s clearly not hands on enough for the little one to really want to be with her. Are you believing all of the hype that Kim has been peddling about motherhood changing her for the better? Or do you think that Nori is just a prop that Kim uses to get a different kind of attention when the mood strikes her? Tell us your thoughts in the comments below! Kate Middelton Says “NO!” – Kris Jenner Plans To Marry North West To Prince George?